The playground just off Magpie Lane, Morley, is to get a �100,000. A community playground in Morley is to get a £100,000 major revamp. New swings, a roundabout, climbing frame and improved safety measures will be installed at the 20-year-old play area just off Magpie Lane. 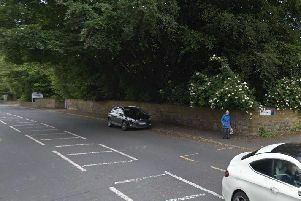 The project will now go ahead after councillors and local people campaigned for the improvements. Coun Neil Dawson said: “This playground serves a large community where there are lots of children growing up. “It makes complete sense to keep the facilities safe and modern. “The park was old and untidy. “This summer they will be able to take full advantage of it. The playground will be re-fenced, given a new safety surface, and new equipment, including radle swings for younger children, two flat swings, a basket swing, a see- saw, a roundabout, a springy and a climbing frame will all be installed. Coun Robert Finnigan said: “The activities and games that children play changes. So we need to upgrade the facilities to fit in with their needs. “The local residents will be delighted. “They have been the driving force behind this campaign. “The new park will give the local community a place to communicate, as there isn’t a place for them for them to meet. The work on the playground, which is in the middle of a large private housing estate is due to be completed by the end of next month. It will be paid for out of the Section 106 fund, which is made up of cash from housing developments in the town. “We would like to refurbish the area every so often. “But that is one of the big benefits of having more housing. The council are also planning a £250,000 project to refurbish Dartmouth Park, however this has not yet been confirmed.